Who doesn’t love spaghetti? 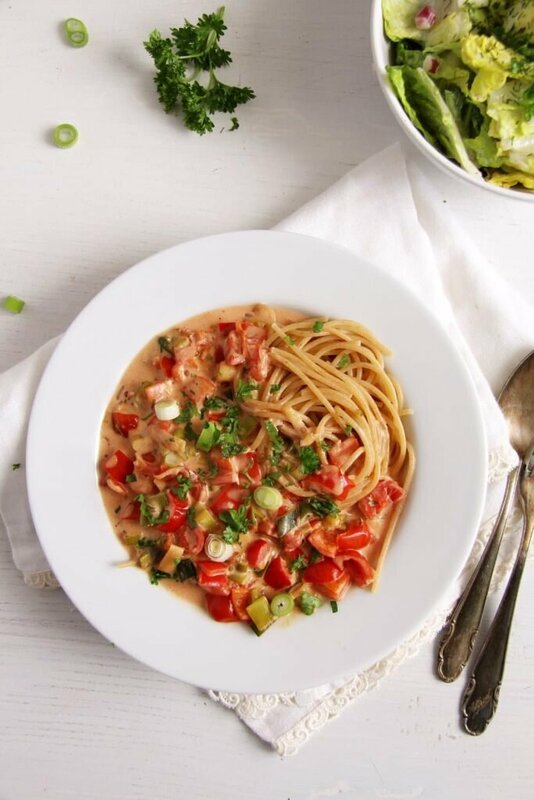 I really cannot think of anyone who would say no to a nice bowl of comforting spaghetti with a creamy yet skinny sauce full of veggies like green onions, bell peppers and tomatoes. We had this only last week, but now that I see the pictures again, I am actually thinking of cooking it again today. It is certainly made with ingredients I always have in the fridge, it’s really a no-fuss thing and it tastes so good, you cannot stop eating. And your children will eat all the vegetables inside without one word of protest. At least mine did! And the sauce is so light and healthy that even moms will be able to enjoy this without worrying too much about the calories. 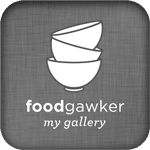 OK, you have the pasta, but it is whole wheat and the sauce, though creamy, it is only made with low-fat milk (1,5% fat) and low-fat cream cheese. Otherwise, only veggies, veggies, veggies. And that wonderful garlic. Chop the bell peppers into small cubes and cut the green onions into thin rings. Heat the oil in a large cast iron pan and cook the peppers and the green onions for a few minutes until a bit softer. Add the herbs and the sugar and let caramelize slightly. Add some salt and pepper. Bring a large pan of water to a boil and cook the spaghetti according to the package's instructions. Remove the seeds of the tomatoes and chop the tomatoes into small cubes. Finely chop or grate the garlic cloves. Mix the milk, cream cheese, vegetable broth and tomato paste in a bowl and whisk carefully until smooth. Add the mixture to the vegetables in the pan together with the chopped tomatoes and garlic. Add salt and pepper to taste and chili powder if you wish to have a hotter dish. Let cook gently until the vegetables are soft and the sauce thickens. 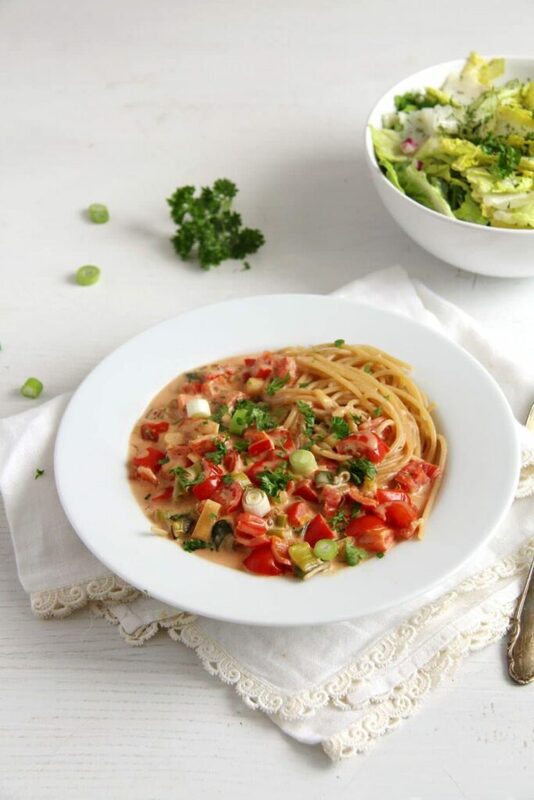 Serve over spaghetti with some green salad on the side. You had me at skinny! 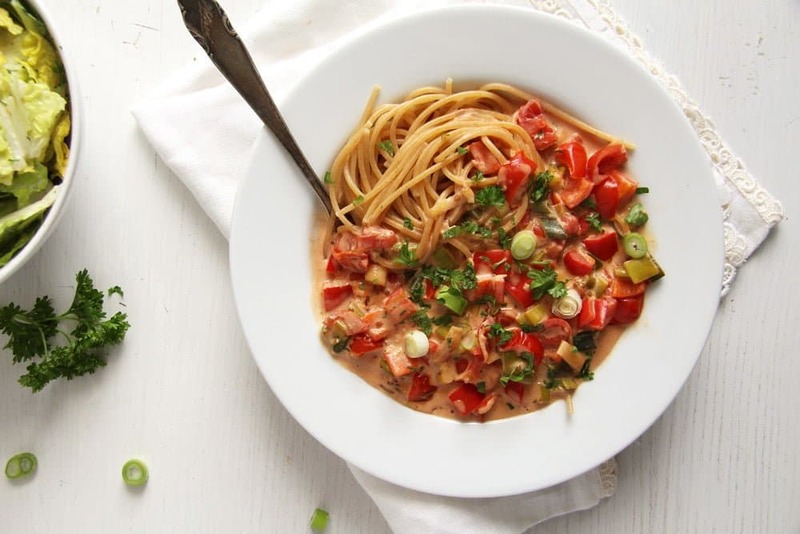 😉 I definitely love spaghetti and green onions, so this pasta is toe-ts calling my name! Cheers, girl! 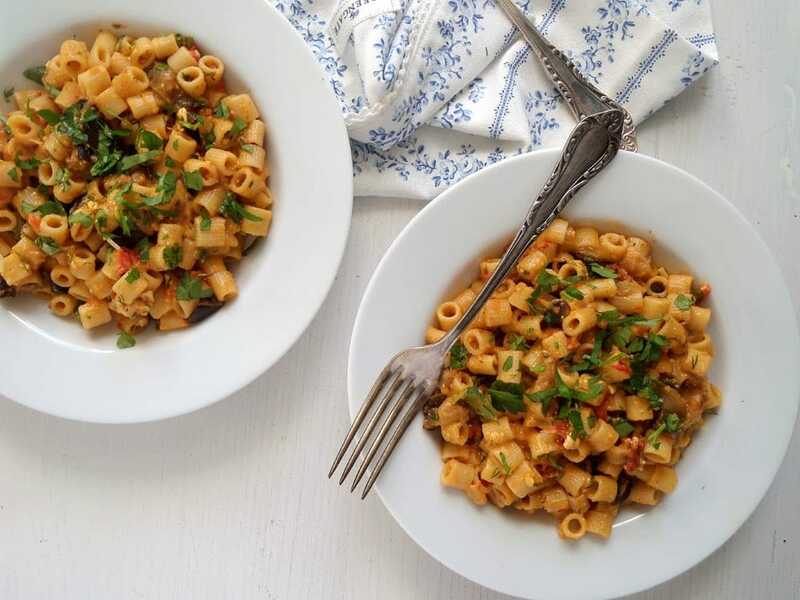 These types of easy from the pantry pastas are favorites in our house – for obvious reasons! Love the name of this one! 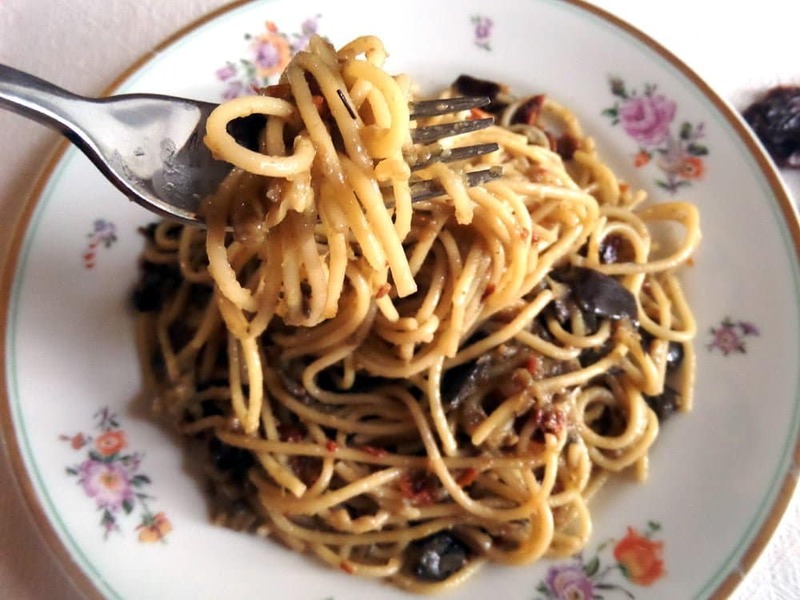 Same here with the pantry pasta, when I think of it I rarely ever buy something special to make pasta, it is normally something I cook on a Sunday or when I don’t want to go shopping. That is one seriously good looking bowl of pasta! Wow! Just love that it is packed full of veggies too! This is calling my name! Pasta is always a winner, especially when creamy sauce is involved. Just want to sit down and dig right in! If you want to make this dish vegan, you could try using soy cream instead of milk and cream cheese, it is thicker than milk. Otherwise I would thicken the sauce with some starch and use some Parmesan for the cheesy taste. I’m not much of a spaghetti person but the skinny green onion sauce has totally sold me on it! Thank you. You could try it with rice or potatoes as well, I’m sure it would work. Some nights I crave for something light and veggie filled, and this is perfect! It looks so pretty too! It looks so pretty – on top of sounding delicious! Anything skinny and I am sold. This spaghetti looks so delicious, Adina. This is so cute and would definitely bring a smile to everyone’s face!